Now, it might not be ‘comfort food’ season in South Africa but it certainly is in the Northern Hemisphere. And quite honestly, yesterday I needed comfort food. It was one of THOSE days where I was irritated and the twins were acting up. I often wonder why kids have this ability to be at their most difficult and challenging when you are on edge and out of patience. But good news, we made it through the day and we were all in need of this comforting, rich and delicious meal. Of all the cuts of Lamb, the shank is my absolute favourite. 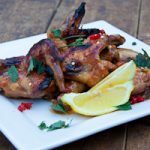 I love how it goes soft and sticky once it’s cooked and, as is the case with all good quality lamb, the flavour is so sweet and almost intense, that when you take the lid off the pot, you’re hit with the most incredible aroma. Paired with juicy, sweet tomatoes and some creamy polenta, how could this NOT be the perfect meal. I’d never actually made polenta before this and I was utterly delighted at the result. In South Africa, a staple food is Maize Meal/Mielie Meal/Pap and Polenta is very similar, it’s just the colour that’s different. Pap he generally served with meat and a tomato based sauce and as I was eating this, I realised that THIS meal, is just fancied up “Pap & Vleis” (pap & meat). 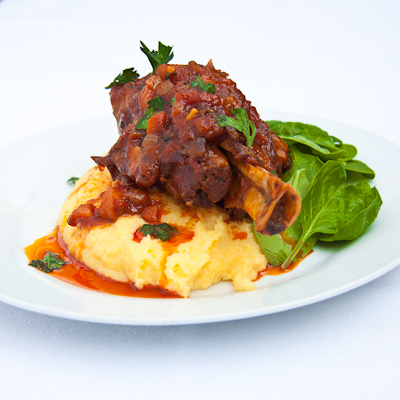 And as with pap, the reduced and thickened tomato sauce that the lamb was cooking in, went perfectly with the Polenta. I suggest you try to get the quick cooking Polenta as it only takes 2 minutes to cook. I just stirred in some parmesand and butter, seasoned to taste and it was perfection. I served our meal with some baby spinach dressed with lemon because I always feel I need something fresh with rich stews/braises. But you could very easily leave it out and still have a fab meal. In a large casserole pot/ dutch oven, brown the shanks in a bit of oil. Remove from pot and set aside. In the same pot, add a bit more oil and fry the onions and carrots until the onions are soft and translucent. Add the garlic and sautè for another minute. Add the chopped tomatoes, tomato puree and lamb shanks back into the pot. Combine the lamb stock with the sugar and herbs and pour into the pot. Cover and place into a pre-heated oven. Allow the lamb shanks to braise for an hour at 200°c then turn the oven down to 160°c and allow to braise for another hour or two until the meat comes off the bone easily. 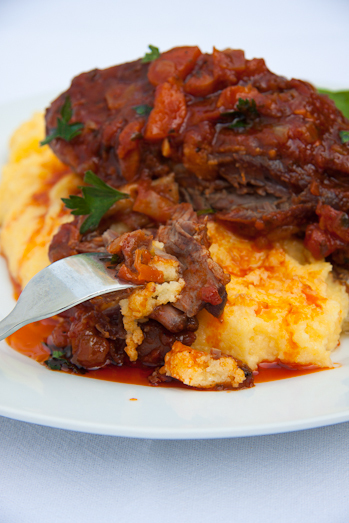 Stir the butter and cheese into the polenta (this is optional) and serve with the lamb shanks. 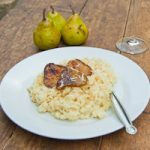 Going to try a curry version of this tonight in my new electric pressure cooker, my best buy this year! Cooked an oxtail Sunday within an hour, awesome! Oooh let me know how it turned out! Nik : Let me know when you did, would love to know what you thought of it. Ahhhhhh…. Lamb shanks, my absolute, alltime favourite meal! Even beats a lamb chop on the braai and that’s saying something! This would go well with couscous, mash, the favourite orzo…… (sorry, had to wipe the drool off my keyboard!) on second thoughts this would probably be awesome on it’s own too!! 😉 Wish I was at your house last night! Tess : This would be fab with anything hehehe. It most certainly is time for comfort food in the northern hemisphere! This dish looks delicious and your photos are awesome! Kitchenboy : Thanx so much for the lovely comments! !